I'm a subscriber to the theories of prominent KGB defector Anatoly Golitsyn. My hero, former CIA counter-intelligence director James Angleton identified Golitsyn as "The most valuable defector ever to reach the West"
Writing in the 1980s Golitsyn correctly predicted the fall of the Berlin Wall, the "abandonment" of communism in Russia and the extensive modification of communism in China. According to Golitsyn, this was all worked out in the late 1950s as part of a long term "scissors strategy". China one blade, Russia the other. Once the West was weak enough, China and Russia would openly re-unite to smash the US with "One Closed Fist". 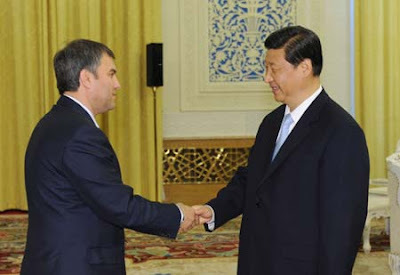 Chinese Vice President Xi Jinping (R) meets with Vyacheslav Volodin, vice chairman of the Russian State Duma, in Beijing, capital of China, June 2, 2009. Representatives from the Communist Party of China (CPC) and the ruling United Russia Party met Tuesday to exchange views on the international financial crisis. "This is the first official and high-level dialogue between the Chinese and Russian ruling parties," said Wang Jiarui, head of the International Department of the CPC Central Committee of his meeting with United Russia Party's council presidium secretary Vyacheslav Volodin. Wang and Volodin signed an agreement on party-to-party cooperation on later Tuesday. Chinese Vice President Xi Jinping attended the signing ceremony. Xi hailed the Sino-Russian relationship when meeting with Volodin before the ceremony, saying that China would work with Russia to promote stable and healthy growth of the ties, in a bid to benefit the two nations and peoples. Volodin, and vice-chairman of the Russian State Duma, said his party valued the cooperation with the CPC. Volodin and his delegation were here on a visit from May 31 to June 3 at the invitation of the International Department of the CPC Central Committee.